When babies are born, they come with an incredibly complicated body that can do amazing things – but have almost no control over any of it. So while they are learning to operate in the big wide world, Mother Nature has equipped them with nine basic reflexes to help them survive in the early days. Stroke the side of your baby’s cheek and she’ll turn towards your hand, open her mouth and then begin a sucking action. The perfect action to establish feeding, the rooting reflex is the most basic of survival instincts and will disappear at around four months. Also known as the startle reflex, this reflex can be seen in action when you hold your baby upright with one hand supporting her neck. Unswaddled, lower her backwards and you’ll see her head and legs extend, her arms jerk upwards and her hands and fingers flex. This reflex most often occurs when your baby’s head moves position quickly, when there is a loud noise or a rapid temperature change. The Moro reflex peaks at around 4 weeks after birth and is usually gone by 8 weeks. For the first six weeks of life, you can see this amazing reflex in your newborn when you hold her upright and place her feet on a flat surface. When the soles of her feet touch the surface she will place one foot in front of the other in a walking motion. You’ll need to take all her body weight though, because she can’t support herself. Although this reflex quickly disappears, it returns as a voluntary movement at around 8 months in preparation for walking. 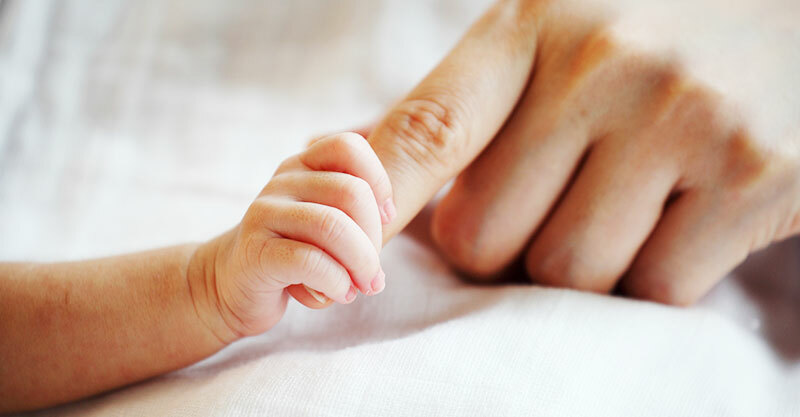 Often called the grasping reflex, this reflex can be seen when you place a finger across your baby’s palm. Her fingers will automatically close around your finger to ‘hold’ it. This reflex is so strong that many babies can support their own weight. You can reverse this reflex by stroking the back of the hand to release the grasp. This reflex is usually gone by 6 months. Sometimes called the fencing reflex because of the position your baby assumes, this reflex is evident when your baby’s head is turned to the side. As the head turns, the arm on the same side will straighten and extend and other arm will raise and bend, so taking on the traditional stance of a fencer. Run a finger down your baby’s back beside her spine and you’ll see her body swing towards the side that’s been stroked. Why? Experts theorise that this reflex prepares the body for crawling. Whatever the reason, the Galant reflex disappears between 4 – 6 months. Place your newborn face down in water and you’ll see her begin to paddle and kick in a swimming motion. Despite looking as though she is swimming, she has no swimming skills and will drown if left unassisted. This is a risky reflex to test as young babies can swallow water while submerged. This reflex disappears between 4 and 6 months. Apply even pressure to both of your baby’s palms and you’ll see the Babkin reflex in action. Your baby will either flex or rotate her head, or open her mouth – or do a combination of all three!